BtSM2011 has been successfully completed, thanks to the intellectual contributions of all of those who participated. Preparations for BtSM2013 have started. The BtSM2013 colloquium will be held in Bandung, Indonesia, on dates still to be determined, probably in May 2013. Documentation regarding the proceedings of BtSM2011 has now (April 18, 2011) been added. More to come. Keep visiting the site. Participants in the Fourth Advanced International Colloquium on Building the Scientific Mind (BtSM2011) will gather in the environment depicted above. They will combine discussing the issues pertinent to the theme of the colloquium, Learning for Sustainable Futures, with walks through the magnificent countryside, sharing meals together, enjoying organic gardening, tasting the wine for which Stellenbosch is famous, and socializing across the diversity of disciplines that will be represented at the colloquium, including the natural sciences, the social and human sciences, and the arts. This fourth colloquium follows in the footsteps of three prior Building the Scientific Mind colloquia, all of them under the patronage and/or with the support of UNESCO, namely BtSM2009, held in Cairo, Egypt, in May 2009; BtSM2007, held in Vancouver, Canada, in May 2007; and BtSM2005, held in The Hague, The Netherlands, in May 2005. This fourth colloquium is deliberately being planned to take place in South Africa so as to favor participation from sub-Sahara Africa, and countries in the southern hemisphere in general, while continuing the practice of the past colloquia to discuss issues regarding the scientific mind in a global perspective. In other words, participation from all parts of the world will be encouraged and we hope to see many familiar faces from the past as well as many new ones. Those new to BtSM may want to check the above links to find out more about the past colloquia so as to have an idea of what to expect in 2011. The dates of the colloquium, 7 to 11 March 2011, are now firm, and so is our collaboration with the Sustainability Institute. Such collaboration could hardly have been more appropriate, considering that we wish to discuss implications for the building of the scientific mind in the perspective of the lead theme for the colloquium, Learning for Sustainable Futures. In addressing issues related to the colloquium theme, we wish, on the one hand, to stress the mutually inclusive character of content, context, and values-driven process in our search for sustainable futures. On the other hand, we wish to assert the need to look beyond content per se. From that latter perspective we are thus less interested in the question of what should be learned (such as fragmented pieces of knowledge that seem to be missing from an already overloaded curriculum) than in how we learn, i.e., what the values are that should drive the learning process and that must thus inspire the learning environment so that, eventually, humans will evolve, culturally, to interact more harmoniously with their environment. We therefore wish to explore what conditions must be present in the environment for learning behavior to emerge that allows humans, individually and collectively, to interact with their environment in ways that lead to sustainable futures. Click here for a photographic overview of the list of participants. The program for the five days is an evolving matter. As this is a colloquium rather than a conference, participants--in particular proposers--play a role in what the program is going to look like. At the start of the colloquium, there will be a set program, on paper, not carved in stone. It may still change as the dialogue evolves. To have an idea of the diversity of the program, a number of elements can be found below. More will be added. Title: Hope for a sustainable future: How one South African university is helping to create a better world. Short description: Stellenbosch University launched its Hope Project in 2010. Through the various initiatives that form the Hope Project the university wishes to contribute to a sustainable future for South Africa and the African continent, not only in terms of the physical world and environment, but also in terms of human and social dimensions. The address will touch on the rationale for the Hope Project and illustrate how the different initiatives contribute to creating a more sustainable future. Paper: Text of welcoming address. Title: Africas Sustainability Challenges  Is there an alternative to the traditional resource-intensive industrialisation pathway to development? Pre-colloquium reference paper: Africa 2050  Growth, Resource Productivity and Decoupling. Slideshow: Africa 2050 - Growth, Resource Productivity and Decoupling. Session type: Guided tour - followed by presentation. Title: The story of the Sustainability Institute and Lynedoch. Session type: Virtual presentation with questions/discussion. Title: Technological Progress and Sustainability: A Look at the History and Future of Human Societies. (a) The peculiar asymptotic development of technology from the nineteenth-century to the present  can it be continued? Should it be continued? (b) What other kinds of futures for human society might there be  that is, futures other than ones with more and more technological advances? Slideshow: Technological Progress and Sustainability: A Look at the History and Future of Human Societies. Backup version of video presentation: Technological Progress and Sustainability: A Look at the History and Future of Human Societies. Title: Building the Sientific Mind: A retrospective overview. Short description: Building the Scientific Mind has been a focus area for research and development of the Learning Development Institute (LDI) since the inception of the Institute in 1999. BtSM has become most prominently expressed in the biennial series of colloquia held since 2005. This talk will briefly highlight the history of BtSM, its driving motives, how these dialogues are associated with the mission and vision of LDI, and what they intend to achieve. Slideshow: Building the Sientific Mind: A retrospective overview: Thoughts at the start of the Fouth Advanced International Colloquoium on Building the Scientific Mind. Title: Learning for Sustainable Futures. An heuristic approach to cultural diversity and resilience. Short description: Resilience  the key link between biological diversity and cultural diversity? What role for learning? The link between the two diversities will be explored, with a special focus on the connection of diversity and resilience. What role for mimetic and cultural learning, sub- and unconscious? How to reinvent ourselves as biosphere relevant species? How to explore the zone between things we know and things we dont know, the tacit, implicit and practical knowledge? Pre-colloquium resource paper: Integration of culture in sustainable development. Abstract of presentation: Resilience - the key link between biological diversity and cultural diversity? What role for mimetic learning and cultural learning? Background document 1: Report of UNESCO workshop on Links between biological and cultural diversity. Background document 2: Report of the international conference on biological and cultural diversity for development--Montreal, June, 2010. Short description: A library can be a vital center of community resource sharing, innovation, and accesspromoting llifelong learning in ways that sustain the individual, the community, society, and the world. Please join this discussion of the current role of libraries in our communities and the future we can fashion for them. Title: Can we create a sustainable structural approach to pedagogy? Short description: Using an open discussion format attendees will be encouraged to peruse one of the challenges facing universities as they plan for sustainability by creating structural, procedural approaches that create outstanding learning experiences efficiently. There are a number of issues and questions: Can pedagogy be sustainable? Is sustainability even possible when dealing with what in a business model is considered a Wicked problem (Rittle & Webber, 1973). That is, a socially based problem which constantly changes, etc. Pre-colloquium resource paper: Can we create a sustainable structural approach to pedagogy? Slideshow: Can we create a sustainable approach to pedagogy? Session type: Seminar followed by debate. The seminar is the first of two activities belonging to a trail titled "Gaming for sustainable futures", aimed at analizing from different perspectives the role that gaming may have in learning for sustainable futures. The activity will be complemented with a workshop designed to explore the challenges involved in designing digital games to address sustainability from a systems thinking approach. Short description: The session will be aimed at analyzing and discussing the relevance of digital games for the development of a sustainable mindset. Research evidence, game-industry wisdom and real-world examples will be analyzed and used to illustrate how digital games can promote the development of complex systemic thinking, which we believe to be crucial to build sustainable futures. The presentation will be followed by a debate involving the audience, in order to allow the convergence of different backgrounds to further enrich and extend the scope of the analysis. Slideshow: Gaming for sustainable futures. Session type: Game design workshop. The workshop is one of the two activities belonging to a trail titled "Gaming for sustainable futures", aimed at analizing from different perspectives the influences of gaming on learning for sustainability. Title: Gaming for sustainable futures: designing games that foster the development of sustainable mindsets. Short description: The workshop will be aimed at experiencing the challenges of designing games that tackle learning for complexity and systems thinking. In the beginning of the workshop, experts in the fields of game design and educational gaming will explain the basic principles to design games and will analyze the main problems that are faced when designing games to foster scientific thinking. Then, participants will be organized in groups, and will be required to design a game concept especially aimed at this purpose, supported by facilitators. Session type: Presentation combined with a challenge for participants to develop methodologies for dealing with a particular problem in groups followed by a dialogue on the various approaches. Short description: The session will begin with a presentation of Sutherland and SAAO, this will establish a context, we will then ask participants to break into smaller groups and tackle a specific problem in relation to the context. We will then briefly present Sutherland Reflections as a case study. The intention is for the session to end in an open dialogue in which participants can add to and critique the project as it stands thus far. Workshop: Ideas proposed by participants. Title: Changing minds; changing lives: Social and economic development of grassroots communities around national archeological parks in Brazil. Short description: Over the past 20 years, educational and socio-economic programs have been developed by the Serra da Capivara national park in Brazil, aiming at combating poverty among the inhabitants of communities around the park and improving the sustainability of both these communities and the natural and archeological heritage in the area. Evaluation has shown that such projects failed to reach their goal. It thus became necessary to change the underlying theoretical framework and methodological practices. With a view to generating critical debate, suggestions will be put forward regarding innovative educational initiatives for the sustainable development of the communities and the preservation of the archeological heritage. One expects to discuss that experience at the Colloquium on BtSM2011 as well to consider new insights for the sustainable development of the communities and the national park conservation. Slideshow: Changing minds; changing lives. Session type: `Fishbowl` where the lead presenter begins with the propositions, a few others are invited to be in the fishbowl with her to engage immediately, and there are 2 empty chairs, which enable others to enter at any time to comment or question before returning to their seats. Title: Feminist Popular Education: Exploring the edges. Short description: This is based on the introduction to an emergent book which is co-edited by me and Linzi Manicom. It contains 14 chapters from about 10 countries and 24 feminist popular educators. The presentation will identify the key themes that have emerged from the writings. As the reviewer of the manuscript states the text is highly original, and extends in multiple directions pedagogical practices that explore non-cognitive, non-linguistic, affective, intuitive and imaginal domains. Short description: We live in times of complex global challenges so interdependent they defy traditional modes of thinking. Decidedly Different scientific minds that cultivate the creativity, fluency and adaptive expertise of integral and wise thinking are fundamental to sustaining a constructive human presence on the earth. Learning environments must be designed to enable students to develop the habits of mind of inquiry-based, design-based and systems-based thinking. This is the cognitive context for designing STEM environments that nurture "decidedly different" scientific minds. This presentation will: (1) frame the new narrative for re-imagining STEM teaching and learning, (2) describe the attributes of decidedly different (integral and wise) scientific minds, and (3) offer learning environment design conditions that drive the creation of a new model. In a workshop conducted in conjunction with this presentation, participants will delve more deeply into these ideas and their implications for design. Pre-colloquium resource paper: Loving the world and our children enough: Nurturing 'Decidedly Different' scientific minds, by design. Paper (full text as presented): Loving the world and our children enough: Nurturing 'Decidedly Cifferent' scientific minds, by design. Title: The ABC (Aim, Belief, Concern) instant research question generator. Short description: A frequently-encountered weakness in graduate research studies is the disconnect between the aim of the research and the actual research questions. Frequently the promise made in the introduction of a thesis is not fulfilled by the time the conclusion is written. The paper describes an application of Burrell & Morgans four paradigms of social science research from which a set of research questions can be derived that will ensure that what a student sets out to do is aligned with the research questions, so that the research methodology can be derived from that. Two dimensions combine  the nature of science and technology, and the nature of society. Resource paper: The ABC (Aim, Belief, Concern) instant research question generator. Title: How do we approach practical, messy problems? A reflection on how to respond to the economic and ecological crises. Short description: The question how to approach practical, messy problems where problems are not well-defined remains actual. The recent financial and economic crisis, as well as an emerging ecological crisis, is an opportunity to reflect on deeper questions on how to approach and inform decisions in the real world. The expectation is that we do not only learn on how to do things better, but also on how to do things differently. Slideshow: How do we approach practical, messy problems? A reflection on how to respond to the economic and ecological crises. Paper: How do we approach practical, messy problems? A reflection on how to respond to the economic and ecological crises. Title: Learning Together the Big History: The Big Bang, Life on Earth, and the Rise of Humanity. Short description: This round table discussion will be on the efficiency and impact of a particular mode of learning, i.e. learning together with a group by watching a series of recorded lectures followed by discussion among the learners with and without a particular expert in the group (the lecturer is not present). I shall start off with a case report from Indonesia: A group of about 20 people with various academic and professional backgrounds met every week for 3 hours to follow and discuss the series of 48 lectures on the Big History by Professor David Christian. Slideshow:Learning Together the Big History: The Big Bang, Life on Earth, and the Rise of Humanity. Title: Promoting dialogue between followers of different medical paradigms to combat the spread of HIV in sub-Saharan Africa. Short description: We have started to integrate HIV related work into the cultural context of the district of Kwango in the Democratic Republic of Congo. The combination of research, intended to find out about the connotations of HIV and AIDS in communities and the terms and metaphors used by chiefs and healers to describe it and to deal with it, and information/training of biomedical personnel and healers has initiated a process of structured dialogue between followers of the different medical paradigms in the district. Slideshow: Integration of work against HIV into the socio-cultural context in sub-Saharan Africa. Title: The Sustainable Innovation Stellenbosch Network. Short description: The Sustainable Innovation Stellenbosch Network is an action research initiative aimed at creating a participatory network for innovation and sustainability in Technopark (Stellenbosch). The initiative also serves as an intervention to kick-start or initiate a transformation or transition of a science/business park toward sustainability, collaboration and innovation. The proposed contact/ dialogue session will be an idea generation debate and critique aimed at brainstorming ideas for putting into place measures to ensure the continuation of the SISN post project completion. As well as methods for constructing a model for replication in other regions, science and business parks. Slideshow: Learning for sustainable futures: The sustainability oriented innovation systems approach. Session type: Presentation and discussion. Title: Wiki as an ecological system. Slideshow: Wiki as an ecological system. Session type: Paper followed by interactive process animated by the presenters. Title: Intergenerational conversations, collective wisdom and ownership in South Africa: teachers, pupils and families engaging with the age of AIDS. Short description: While the dominant story of AIDS remains a medical construction, in South Africa the pandemic can be understood as testimonial of the struggle many people have in protecting and promoting life  their own and others. This paper will reflect on our own fledgling work to inspire intergenerational conversations within and between families through the use of new film on HIV produced by MTV, Shuga, in the University of the Western Capes teacher education programmes. These new conversations move beyond simply breaking the silence and seek to create spaces where families and communities can animate new possibilities for themselves and begin not simply to own the AIDS pandemic but to reclaim a process that values their own collective wisdom and sustains their own journeys toward the future. Slideshow: Intergenerational conversations, collective wisdom and ownership in South Africa: teachers, pupils and families engaging with the age of AIDS. All the different episodes of the movie can be watched here, including Episode 3 (which was used by Jim during his presentation), without the need to first download the movie. Session type: Presentation + roundtable. Title: Promoting reasoning skills via subject focus literacy approaches. Short description: The focus of this discussion is on selected recent South African research studies that have explored efforts to promote the discussion, writing, and arguing aspects of subject specific literacy in primary and middle schools, particularly amongst second-language learners. These studies reveal improvements in the participants' abilities to write and argue their findings, as well as statistically significant improvement in their problem solving skills. Slideshow: Promoting reasoning skills via subject focus literacy approaches. Session type: Presentation + discussion. Title: Learning to act: Implications for educational reform and sustainable future, and potential aid from music training. Short description: The 21st century increasingly demands the best from each of us, mentally and emotionally. Current educational emphasis on learning focusing upon information must be supplemented by better training to build mental and emotional capabilities for thinking skillfully and acting wisely, individually and together. An example of a training opportunity involving music will be discussed. As we increasingly develop ourselves as actors, new paths in the current world and building towards sustainable future can open. Title: Antibiotic stewardship for a sustainable future. Short description: Almost simultaneously with the introduction of antimicrobials into medical therapy, came the development of resistance mechanisms in microorganisms. Prolific, uncontrolled, and disorganized use of antibiotics in both medical and veterinary settings including the untargeted use of antibiotics to enable animal husbandry in overcrowded farms have now contributed to a situation in which harmful microbes can no longer be treated with common antibiotics. There are no new drug discoveries in the pipeline for certain infectious which are now spreading by worldwide travel. A new field of infectious diseases - antibiotic stewardship - is now evolving in an attempt to contain this resistance problem conserving current antibiotic efficacy for as long as possible. These concepts will be discussed during this session. Slideshow: Antibiotic stewardship for a sustainable future. Title: Can we find the next Einstein in Africa?. Slideshow: Can we find the next Einstein in Africa? Short description: The International Astronomical Union, in recognition of the immense use of astronomy to stimulate development, has developed a decadal strategy entitled "Astronomy for the Developing World". At the heart of the implementation is the Global Office for Astronomy Development (OAD) which becomes active on 1st March 2011. The host of this office, the South African Astronomical Observatory, has a record of using astronomy for development through the Southern African Large Telescope's Collateral Benefits Programme. Highlights from this programme as well as plans for the GOAD will be discussed in the context of using astronomy for development, especially in Africa. Title: Health, Human Learning, Scientific Inquiry and Sustainable Futures. The SIG will function during all five days of the colloquium during afternoon sessions. For detailed information contact Muriel. A Picasa Web Album of photos made by our official photopgrapher, Anya Patarakina, is available here. A different, shorter, series of photos is available here via the Facebook page of the Learning Development Institute. And here is one created by Carolina Ödman Govender. A videographic impression of the Colloquium, equally produced by Anya Patarakina, is available via YouTube here. Alternatively, you can download it directly from the learndev.org server here, which may take a few minutes, considering the 16MB size of the MP4 file. Based on the program elements listed above, and the lengthier descriptions contained in the proposals submitted by participants, a day-to-day program was developed, which is available here. Minor adjustments may still be made. The nearest international airport in the vicinity of Stellenbosch is Cape Town (CPT). Take a taxi from there to Stellenbosch. There are direct flights to Cape Town from major airline hubs around the world. If your connection with Johannesburg is better, faster, more economical or easier, then there is an abundance of flights during the day and evening that connect Johannesburg (JNB) and Cape Town. You may also want to route your itinerary through JNB if you plan on combining your attendance of the colloquium with tourism in South Africa. Some places of interest, such as Kruger National Park, can be more easily reached from Johannesburg. On the other hand, there are beautiful opportunities for tourism in the Cape Town area as well. Use your favorite search engine to find out. Search for phrases such as "Garden Route", "West Coast", "Cape Peninsula", and "Hermanus". Participants are expected to make arrangements for their daily displacements between hotels and the meeting venue. Most hotels will be willing to help making such arrangements. Participants who stay in the same or proximate hotels may want to make such arrangements collectively, using minibus services. Hotels will be able to advise. The official colloquium hotel, d'Ouwe Werf, advises specifically that "Receptionist and Duty Managers will assist the guests if they want to arrange a shuttle transfer service or taxi to Lynedoch during their stay. They can just call Reception for assistance or once they check-in give their transfer details to the Receptionist who will gladly assist." Those staying at other hotels, B&B's or guest houses, please check with them upon or prior to arrival. Those interested in car rental find multiple options using the search words 'car rental cpt airport' when searching the Web. Rates are quite affordable compared with current rates in Europe and North America (we found rates as low as  13 per day for a small car with unlimited mileage). Do note that in South Africa one drives on the left side of the road, like in the UK. Not a big deal when you are a driver. You just follow what other drivers are doing. However, as a pedestrian you must be careful when crossing a road as you tend to look the wrong way for oncoming traffic! The management of the colloquium hotel, d'Ouwe Werf, advises that they "have valet parking which is free of charge. Therefore the guests just stop their cars at our green valet parking sign and the driver parks for them in the garage. If the guests require their car they can phone down to Reception 5 minutes before they want to leave and the driver will once again get their car ready for them in front of the hotel." Those staying at other hotels, B&B's or guest houses, please check about parking facilities with them upon or prior to arrival. If you take a taxi from CPT airport, make sure you have printed clear instructions, i.e., a map of your hotel, B&B or guest house, to show to the taxi man. Taxis can all be found just outside the airport. Ask at the Info Desk at CPT if you are not sure where to find them. First of all, if you drive, here is a map and itinerary that will help you find your way from Cape Town International airport (CPT) to Stellenbosch. Should you arrive late and want to drive directly from CPT airport to the colloquium venue, then use this map and itinerary. Finally, for those who drive from Stellenbosch to the colloquium venue in Lynedoch, you will find your way using this map and itinerary. 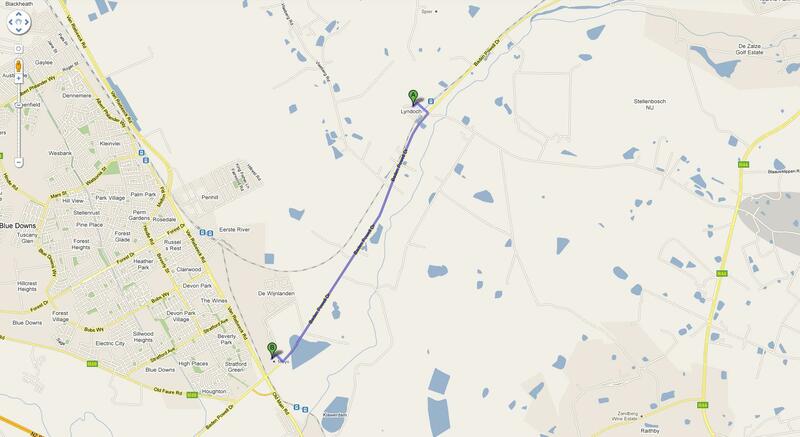 To facilitate your moving around in the area, please find below the coordinates of several places of interest. You can copy and paste them into Google Earth or Google Maps to find and look around in those locations. The Sustainability Institute--located at -33°58'57.96", 18°46'5.38"--and the Guest House of the Institute--located at -33°58'56.89, 18°46'4.41"--can both be seen in this picture. Not far from the Sustainability Institute is the Moyo restaurant--located at -34° 1' 10.38", 18° 44' 35.95"--where we will have the official conference dinner on Thursday night. This map shows how the Moyo (B) and the Institute (A) are located one with respect to the other. It is not advisable to walk along the road, particularly not at night, because of the traffic. Finally, while in Stellenbosch, you may want to know the location of the official colloquium hotel, DOuwe Werf--located at -33°56'16.10", 18°51'43.62"--which can be seen on this map. Use the coordinates in Google Earth or Google Maps to explore the city for what it has to offer in terms of restaurants and the like. Use 'street view' to make a virtual tour of any area of interest. Those who arrive early may want to know that On Sunday, 6 March the Soweto Gospel Choir will be performing at the Spier amphitheatre. This should be quite a nice cultural event to experience. See for more information and to make direct online bookings the following Computicket site: http://www.computicket.com/web/event/soweto_gospel_choir_nianell/303914634/0/23360388. Our meeting, workshop and special interest sessions take place at the Sustainability Institute at the Lynedoch EcoVillage. Click here to access a schematic map showing how to reach the Sustainability Institute. You may also want to access this map to a green future or to search Google Maps for "Lynedoch, Baden Powell, Western Cape". This map shows the geographical location of both Stellenbosch and several Lynedoch landmarks. Participants may want to stay at one of the hotels in Stellenbosch. The bigger hotels (d'Ouwe Werf Hotel and the Stellenbosch Hotel) will be able to arrange group transport at shared cost to the meeting venue; at smaller places (Bed & Breakfast facilities) one may have to make such arrangements on an individual basis. Hotel d'Ouwe Werf is the official colloquium hotel, where we expect to see many of the participants. It's generally considered to be the best hotel available in town, but there are many good alternatives that we list as well. In general, the nightly rates are quite affordable compared to European or North American standards. 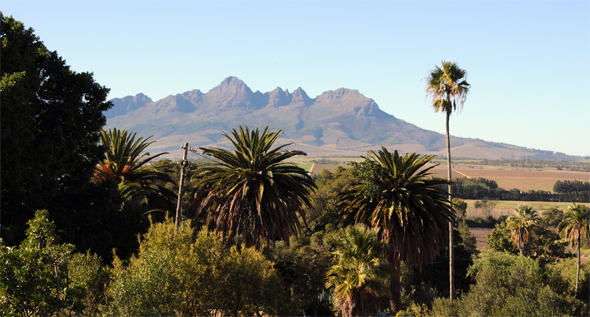 Following is our list of recommended hotels in Stellenbosch. Rates in South African Rand can be converted into the currency of your choice using a Web-based currency converter, such as the Oanda currency converter. Click on the links for the repective hotels to find out more about each of them. R 990.00 per single room per night. R 1180.00 per double room per night. These rates are inclusive of breakfast and 14% VAT, but exclusive of 1% Tourism Levy. Mention this arrangement when you make your booking. NOTE:This hotel is in high demand. As of the date of the present update (Dec 27, 2010) it appearsto be fully booked. However, you can always still try in case there is a cancellation. We received from them this linked price overview that will apply to bookings made with them for the colloquium. For further details check out their Web site or contact the hotel directly. is a guesthouse, offering bed & breakfast in style. They are located at 17 van Riebeeck Street. 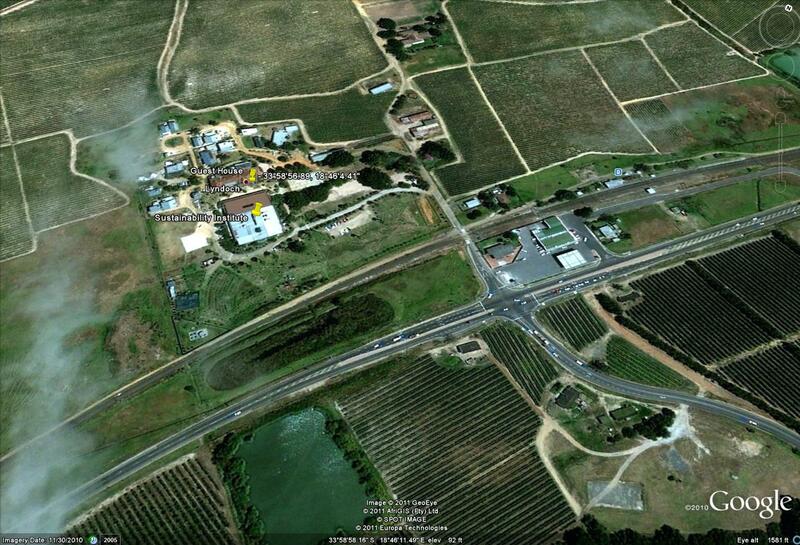 This Bed & Breakfast is located at 14 van Riebeeck Street, just across from Bonne Esperance (see above). This is a high end option, considerably more expensive than any of the above alternatives. Besides the luxury they offer, they have the advantage of being located at walking distance from the Sustainability Institute at R310, Lynedoch Road, Stellenbosch. Their obvious disadvantage is that you won't enjoy the city of Stellenbosch as much as when you would choose to stay in town and you may have diminished contact with your fellow BtSM2011 participants. Conditions are basic but, within that category, very good. This option may be particularly attractive to those participants who can spend less and whose ability to participate is limited to a low budget choices. There are some ten or eleven rooms available, each with two beds. Ideally, this could accommodate up to 20 or 22 people sharing rooms. Like in the case of the Spier Hotel, you will be away from the city of Stellenbosch, which may affect the kind of contact that you will have with the participants staying in Stellenbosch proper. Interested participants should write directly Gyro Valentyn. Should you need help, please contact Jan Visser. In addition to the above options, you may want to check out your preferred online or offline travel agent for alternative hotel options. Keep in mind that the colloquium takes place during the high season. We therefore recommend that you make your bookings as early as possible.